Boasting a prime setting in Rocky Mount, this delightful hotel is the perfect choice for business and leisure travellers alike. Guests will find themselves within easy access of many key points of interest in the area, including the Children's Museum and Science Centre, Rocky Mount Arts Centre and Wesleyan College. This hotel also offers guests ease of access to the Tar River Paddle Trail, where a number of exciting recreational activities can be enjoyed, including canoeing and kayaking. This delightful hotel greets guests with a bright, welcoming exterior, and a relaxing ambience. The guest rooms are tastefully appointed, and come complete with modern amenities for added comfort and convenience. The hotel offers a range of excellent facilities, catering to the needs of every type of traveller. Enjoy Southern Hospitality at Our Rocky Mount, NC Hotel Ideally situated off of I-95 and US 64, the Holiday Inn of Rocky Mount, North Carolina provides comfortable and friendly accommodations for both leisure & corporate travelers. This 6-story hotel offers a blend of contemporary decor and features that distinguishes it as one of Rocky Mount's premier hotels. 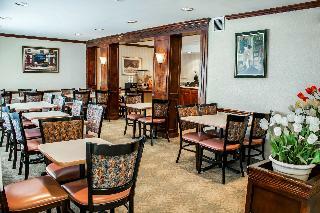 Business travelers find that we are conveniently located near prominent businesses and corporate offices. North Carolina Wesleyan College, PNC Bank, Hospira, MBM, Honeywell, CDC, Nash Community College and Nash General Hospital are just minutes from our hotel in Rocky Mount. We offer a business center and complimentary, high-speed, wireless Internet access in all guest rooms, public areas & meeting spaces. For leisure travelers, our Rocky Mount hotel offers easy access to unique attractions such as The Imperial Centre, Rocky Mount Sports Complex and The Dunn Center for the Performing Arts. While lodging in our Rocky Mount, North Carolina hotel, guests can enjoy the comforts of an indoor, heated pool, a 24-hour fitness center and a sundries shop. You can enjoy our Martini Bar for your favorite beverages. Bistro 64 Restaurant serves an excellent menu with the freshest ingredients for breakfast, dinner and room service. We have an outstanding staff waiting to make you feel at home. Book with us today to enjoy our outstanding Rocky Mount, NC hotel.